On the Fourth, we had so much fun playing with sparklers. We skipped watching fireworks altogether, although there were plenty to be heard in the neighborhood. Right before dinner, we made an emergency run down to the place where they were selling fireworks and picked up a giant pack of sparklers. 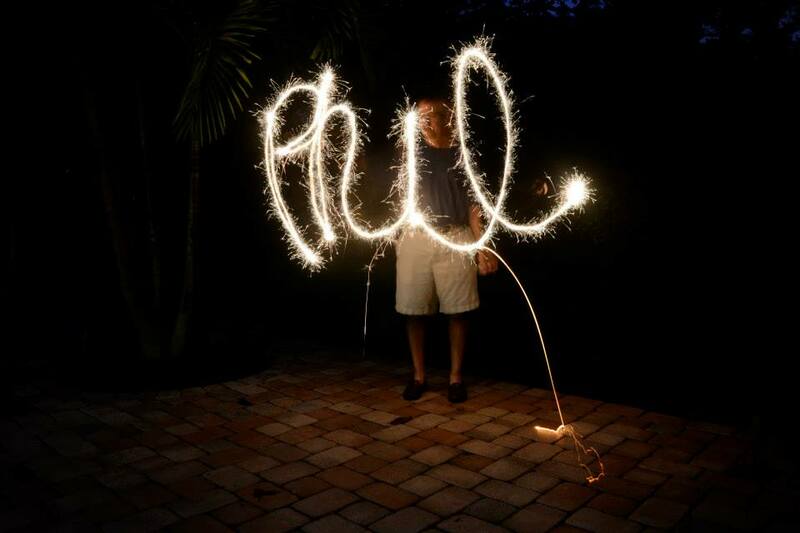 We decided to spell things out with the sparklers and record it on camera. We were super excited for that sun to go down. My sister and her friend and I just sat out on the porch waiting for the sun to finally drop and for the sky to turn dark enough for photos. Finally, after about three pieces of brownies (each) and giant slices of pie with ice cream, our wait on the porch was over. It’s not terribly hard to take the pictures at all… and the effect is just awesome. After posting one of the pictures to Instagram (omg it made the popular page!!! 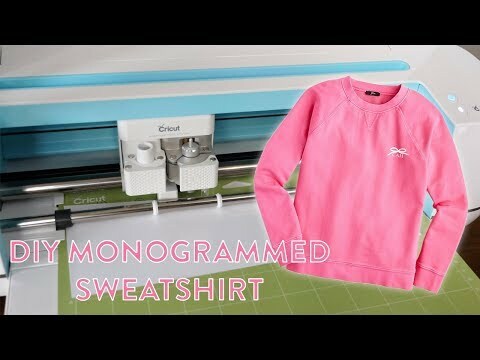 ), I was flooded with emails and comments and tweets on how to do it. I honestly think that this is a fun thing to do… even if it’s not the Fourth. It’s a great summer night activity. You can go for hours experimenting with new techniques and multiple people! You do need a few people to help you out though. The more the merrier. Our dad joined in (because apparently writing with sparklers was one of his unfulfilled lifelong dreams), as did our mom and grandma and another friend who stopped by. People (4): (Because it was drizzling outside, we had to have an extra person holding an umbrella over the camera.) So we had: one person manning the camera, one person holding the umbrella, one person lighting the sparklers, and the last person was the one doing the writing. Camera: We used my sisters Nikon D3100. Tripod: You really need to have the camera still, but you could also rest it on something (like a brick ledge or an outdoor table) if you don’t have a tripod. Sparklers: We got the sparklers that don’t burn all the way down. I highly recommend them. I think they’re like safety sparklers or something. You’re writing in the dark… so you can’t exactly tell when that flame will get to the bottom. Better safe than sorry. Lighter/Matches: Either work. Lighters are probably easier! Before you can get started with the writing, make sure you have your camera settings all good-to-go. We only had to experiment a tiny bit before we were ready! (And honestly that was more to do with the writing technique than the camera settings!) Don’t forget to make sure that the camera is tightly secured on the tripod. It shouldn’t take wiggle at all when you release the shutter button and move your hand. Put your camera on Shutter Priority Mode. That will allow you to control the shutter speed (which is how long the shutter stays open). We played around with the time and found that, depending on the word, 10 seconds was enough. For shorter things, like drawing a heart, 5 seconds was plenty long. For longer things, like drawing the Zeta crown, 13 seconds gave us time to finish drawing! If you’re right-handed, you’ll notice that you have much more space to write at the beginning than you do at the end of the word as your arm has to reach across your body. Adjust for that as you play around! Same for lefties, but you’ll have less space at the beginning of the word. Cursive works the best! 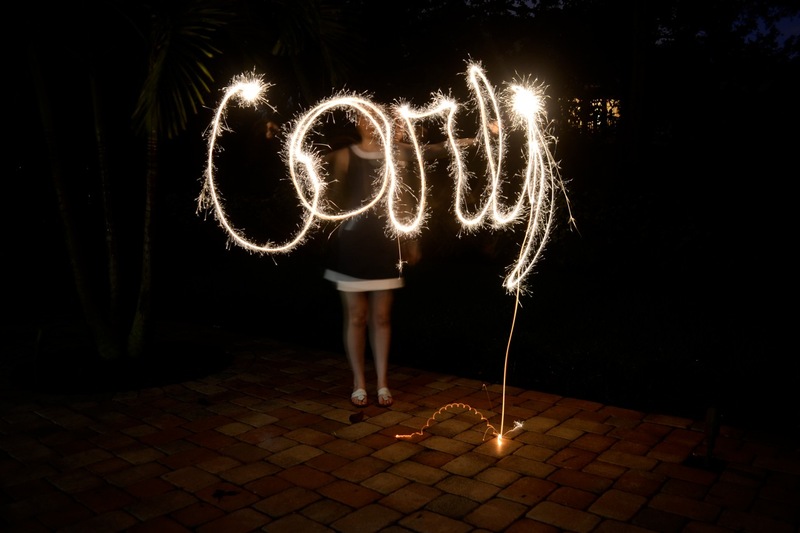 The camera picks up all of the sparklers movements, so you can’t stop to create space between letters. Keep the sparkler flowing and moving consistently and loopy! In practice, the person lighting the sparkler would light it and then move out of the way back to the camera. The person writing would simultaneously position her hand where she wanted to start and tell the camera girl that she was ready. The shutter click is loud enough so the writer can hear it and begin to write when it clicks open. If she finishes writing before the shutter closes again, then she should just keep her hand still (holding the sparkler) and wait for it to close. Writing backwards is a little tricky… I obviously struggled with that “y” at the end of my name! Stacy and her friend did this together. Monica drew the crown and Stacy was writing the ZTA. Teamwork makes the dream work. The heart is simple and can be done by one person, but it’s adorable with two. This would be fun to do with a couple for a wedding or an engagement announcement! 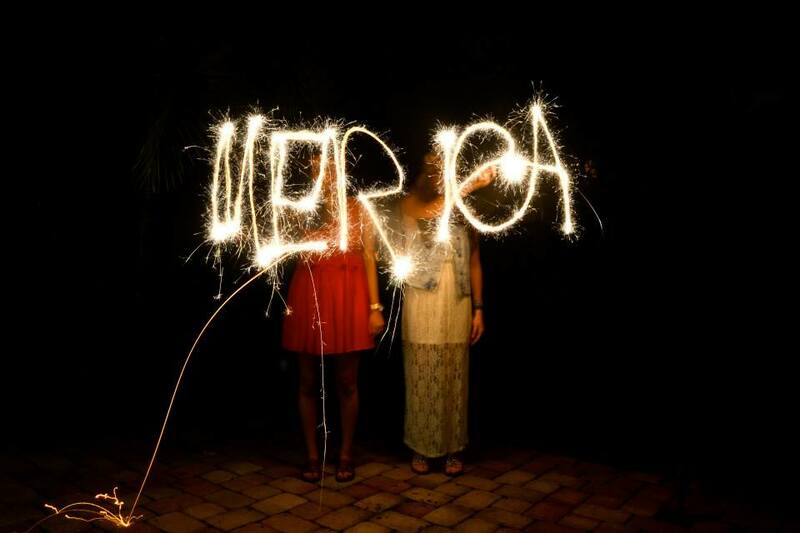 Have you ever tried writing with sparklers? Your sister's a Zeta?! ZLAM!! I've done this writing with sparklers before and you seemed to have fabulous results! Your pictures look amazing! This is awesome! My boyfriend and I really wanted to try this sometime 🙂 The heart is perfect! Thanks for the great tips! 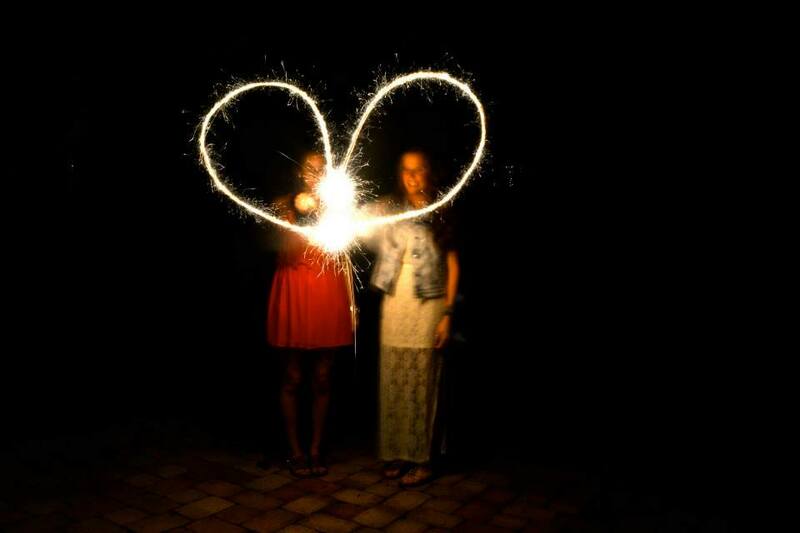 The heart with sparklers is a great idea for a wedding announcement. Thanks, Carly! omg, this looks super cool!!! i need to try it before the 4th of july weekend is over. Haha. That looks amazing!!! I always wanted to know how, now I do!!! super cute! I love taking photos like this. It's fun doing it with colored lights too! This is so cool! My friends and I love doing this. It's so much fun, and the pictures come out looking amazing! Ah this isn't nearly as hard as I thought it was. I definitely want to try this sometime this summer! love your sister's ZTA picture! I love this, I've done it before with my Cell Phone. If you want your writing to look a bit better you can write the normal way and then just flip the picture when you upload it to your computer. 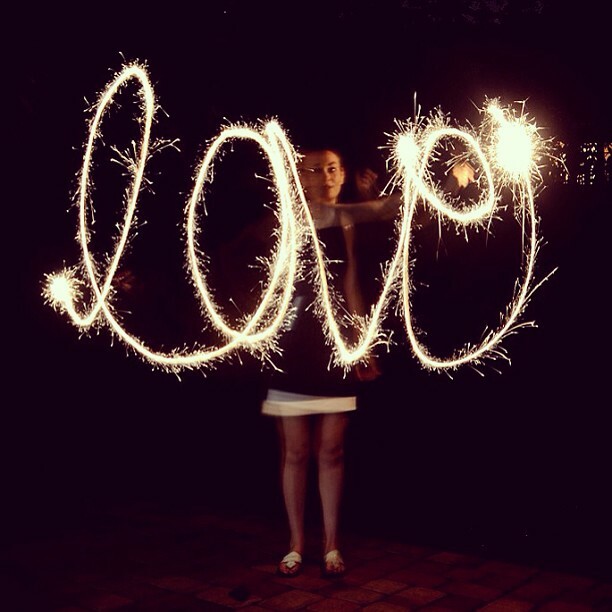 Love shooting sparkler writing! I've done it many, many times! We've ended up with some pretty cool designs when I let the kids "take over". Also, you can let the person write normally, then flip the picture during editing. There's not much detail in the face or background to really notice that the photo was flipped. Thank you! You can write normally, left to right, and then invert the image. Way easier than learning how to write in cursive backwards. Thank you so much! I’ve always wondered how people did this! Wow! These are so good! Would it be possible to write your name the correct way (left to right) and then flip the image in photoshop? 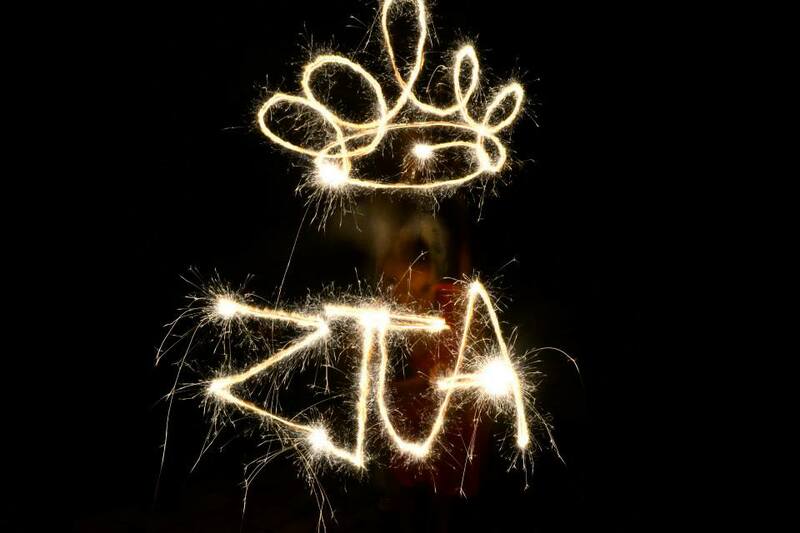 Found this site and looked up how to write with sparklers….loved your post because I am a ZTA too!! !